How's everyone doing this week? I hope you haven't have a crazy week like I had. So my new companion sister Haupt (it's a German last name but she is American) and I moved to our new area Qi Shan last Monday. Qi Shan is a beautiful place with a lot of greens. Yes, I have moved away from the city area and into a rural area. It takes about an hour bus ride from City to this place so it wasn't too bad. I absolutely love this place for many reasons: everything is cheaper, the air is fresher, the people are humble and friendly, though the areas we cover are gigantic, our apartment is in the centre of the town so we can access to stores and restaurant easily. The Qi Shan ward is a lot smaller than my previous area. But I love working in small ward because missionaries will become part of the ward a lot quicker and able to work more closely with the members. Since Sister Haupt and I open the new area, we are trying to set up time to meet with most of the recent converts and some active members this week. One thing that I know I definitely have to be better at is to ride the bike quicker. Our areas (the 2 mains area we focus on out of 5 /6 areas are Qi Shan and MeiNong) are sooo big that it takes 45 mins to get to some members house. No kidding! After talking to Bishop and the RS president, Sister Haupt and I both feel that there are a lot we can do to help strengthen this ward and we are both very excited and grateful we got sent here despite the slow week for our 1st week here. 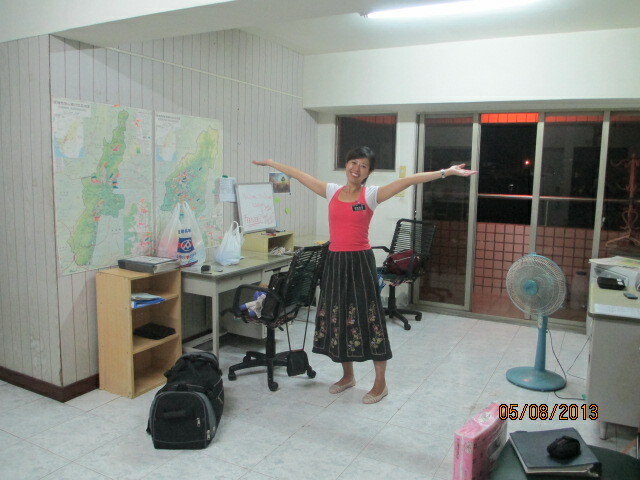 I know I will learn so much that the Lord wants me to learn here in this area. Stretching time! Also, I got permission (cause it's outside my district) to attend Sister Dai's baptism (a girl Sister Jian and I taught back in San Min) last Friday! It was a beautiful baptism.As she immersed into the water by the priesthood holder and came out from the water, I just have one of the warmest feeling in my heart. It reminds me of a verse in Alma 29:9 " I know that which the Lord hath commanded me, and I glory in it. I do not glory of myself, but I glory in that which the Lord hath commanded me; yea, and this is my glory, that perhaps I may be an instrument in the hands of God to bring some soul to repentance; and this is my joy." I thanked the Lord for letting me be part of the tool to bring this soul into His church. Too bad I didn't get a chance to hear her testimony because I have to rush back to my area before 9pm so I have to leave right after the baptism ceremony. 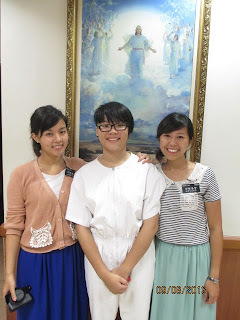 Sister Jian, Sister Dai and me. 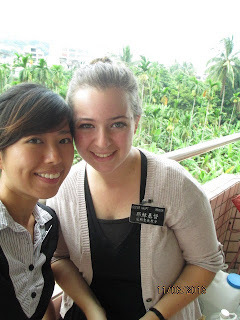 My new companion , sister Haupt (He Jie Mei).... from the balcony of our aprtment with very green view at the back. 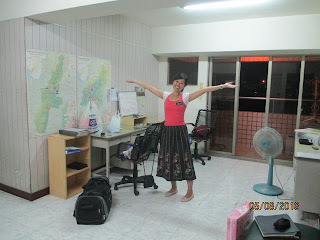 First night when we got to our apartment.. It was previously the Elder's apartment but they moved to a new house in MeiNong area. Okay, don't even get me started with the cleanliness of the apartment! The conclusion we got that night was: ask your future husband's mission companion how clean is their apartment before you say YES. 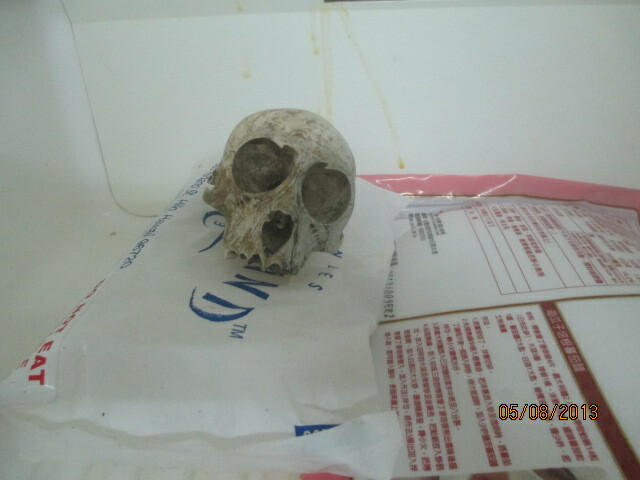 A house warming present from the Elders: A MONKEY SKULL IN OUR FREEZER! Congratulation to those who received their mission calls and ready to leave!